**** Chosen by Winner: Scott S.
File photo of similar knife. The Mannschaft is what you get when you combine the worlds most popular key carrier, the KeyBar, with the most innovative knife locking mechanism ever devised, The Klecker Lock. The Mannschaft is a one-time limited production run of our collaboration with KeyBar and we made only 50 of them in total. Once they are gone, they are gone. This Mannschaft is number 43 of 50. 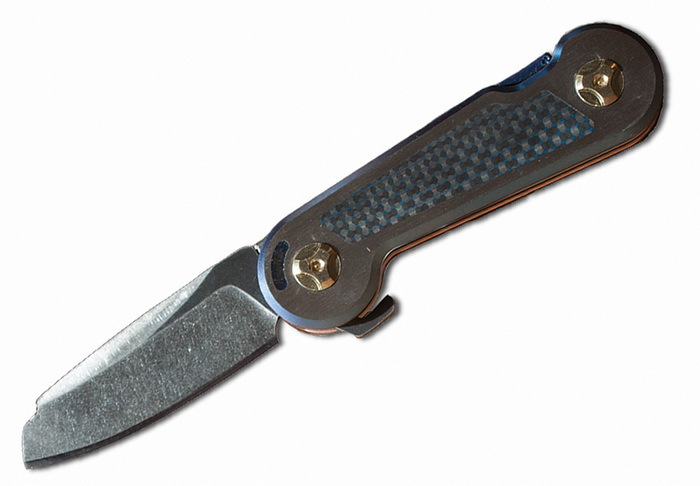 The Chassis of the knife is the innovative new knife module by Klecker Knives and is built with a custom 154CM Sheepsfoot knife blade built for us by American Steel Worx. The side panels are machined Titanium with a Carbon Fiber insert. The side panels are accented with custom copper liners and a Copper "unlock" Thumb Pad. Comes packed in a custom wood and leather cylinder with standard KeyBar hardware and can be expanded like a standard KeyBar to hold keys or more tools. Klecker Knives is a collaboration between Glenn and Nathan Klecker, a father and son, who love knives and sharing that passion with Adults and Kids, especially those who want to learn more about knives in safe and fun ways. Glenn is a Marine Veteran who served time in the Middle East leading Marines and who took up knife and tool design after returning home. His passion is for creating new and better ways of solving problems. In addition to his knife and tool designs, he has designed products for many companies including Leatherman, CRKT, Ford Motor Company, Crimson Trace. Nathan, although only 10, came up with his first design “Nathan’s Knife Kit” when he was six, which turned into a cool book and eventually a hot new product picked up by CRKT. He is a creative youngster with a passion for Knives, Legos and Robotics.